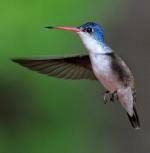 Cinnamon Hummingbird: Medium size, bicolored hummingbird with bronze green upperparts and cinnamon colored underparts. The tail is square, rufous with gold-green edging. This promiscuous bird attracts a female by flying back and forth like a swing. Both sexes are protective of feeding territories. Cinnamon Hummingbird: Accidental in southern Arizona and southwestern New Mexico. Common in native Mexico to Central America. Found in a wide variety of habitats at low elevations, such as plantations, scrublands with thorns, arid areas, woodland edges, and grassy fields and pastures. The Cinnamon Hummingbird is native to northwestern Mexico and Costa Rica, as well as other parts of Central America. It is a medium-sized hummingbird which may occasionally visit southern Arizona and southwestern New Mexico in the United States also. These birds are extremely protective of their feeding territories, and frequently live in lowlands of subtropical and tropical climates. The Cinnamon Hummingbird may be found in dry forests, moist lowland forests, dry shrublands and heavily degraded former forests in these climate regions. They do not migrate during winter months, and feed on small insects and flora nectar. The Cinnamon Hummingbird’s current conservation rating is Least Concern. 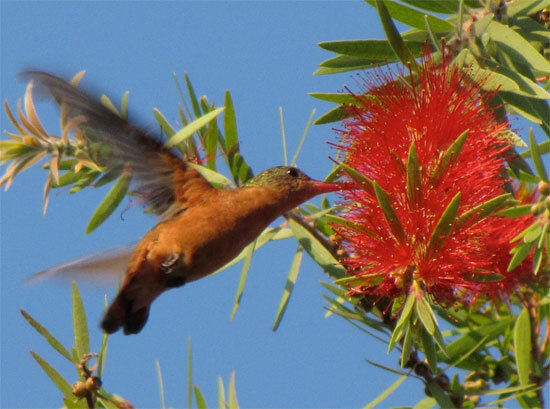 The female Cinnamon Hummingbird lays 2 white eggs that measure 0.5 inches in length. A group of hummingbirds has many collective nouns, including a “bouquet", "glittering", "hover", "shimmer", and "tune” of hummingbirds.